Green People Daily Aloe Shampoo is a soothing natural shampoo for all hair types combining organic aloe vera and lavender. Aqua, Glycerin, Decyl Glucoside, Cocamidopropyl Betaine, Cocamidopropyl Betainamide Mea Chloride, Aloe Barbadensis Leaf Juice Powder*, Olea Europaea Fruit Oil*, Aroma [Lavandula Angustifolia Herb Oil*^, Lavandula Hybrida Herb Oil*], Linalool*. Apply small amount to wet hair, rinse thoroughly and follow with conditioner. 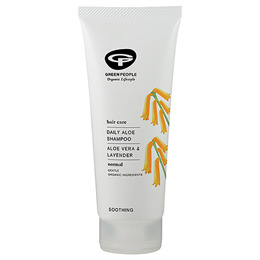 Below are reviews of Green People Daily Aloe Shampoo - 200ml by bodykind customers. If you have tried this product we'd love to hear what you think so please leave a review. Fantastic long-lasting product, with minimal ingredients and gorgeous smell, meaning that I can confidently use it all over the body. Would highly recommend it.